Are you looking for a delicious vegetables recipe with a difference? If you are, you’ve found it! 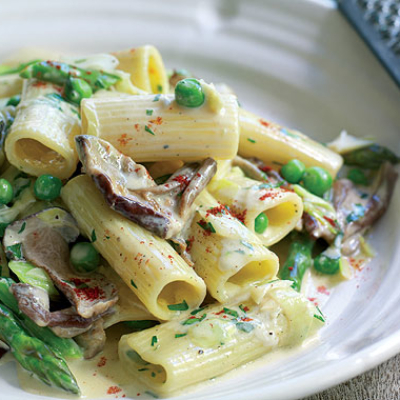 Here’s my rigatoni with peas and porcini mushrooms in a creamy asparagus sauce for you to enjoy. 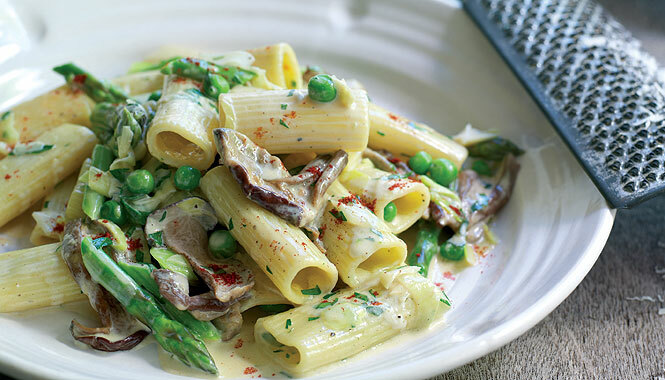 Feast your eyes on the finest rigatoni with peas and porcini mushrooms in a creamy asparagus sauce! It’s straightforward and fun to make this great dish. Simply follow the instructions below and get the perfect result. Use a potato peeler to scrape the asparagus stalks, discarding the woody ends. Chop the stalks into 2cm long pieces. Drop into a medium saucepan of boiling salted water and cook for 2 minutes. Drain and immediately refresh under cold running water to prevent them from discolouring. Set aside. Melt the butter in a large frying pan over a medium heat. Add the peas, mushrooms, leeks and asparagus and fry for 5 minutes, stirring occasionally with a wooden spoon. Pour in the cream and continue to cook for a further minute, stirring continuously. Mix in the parsley and paprika, season with salt and set aside. Meanwhile cook the pasta in a large saucepan of boiling salted water until al dente. Drain and tip back into the same pan. Pour in the asparagus sauce and stir everything together for 30 seconds to allow the flavours to combine. Divide between four serving plates, sprinkle over the Pecorino cheese and serve immediately. 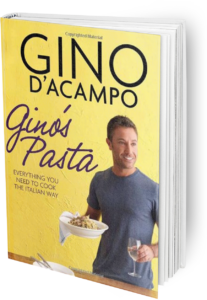 Once you’re done, simply sit back and enjoy your rigatoni with peas and porcini mushrooms in a creamy asparagus sauce and don’t forget to check out other great authentic Italian recipes including great antipasti recipes, Italian pasta recipes, Italian soup recipes, Italian beef dishes and authentic pizza recipes.